Paria Zandi, Campus Care Advocate is on campus to help anybody who has been a victim or survivor of sexual violence. Photo by David J. Hawkins. 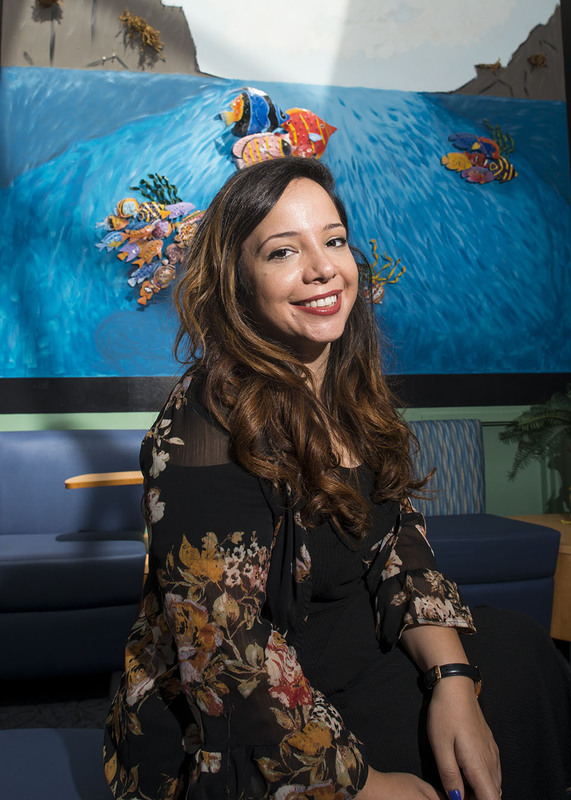 Since her arrival at California State University, Northridge last year, Paria Zandi has worked to empower survivors of sexual violence, interpersonal abuse and stalking, through a trauma-informed and culturally responsive lens. As CSUN’s care advocate, Zandi provides a confidential space for survivors to discuss their experiences, concerns and options. Zandi understands the short- and long-term effects a survivor may experience and, she said, she’s committed to providing advocacy services to meet the unique needs of every survivor. “Every person coming in [for advocacy services] has a different circumstance,” Zandi said. “My role is to help inform survivors of their options, so they can make decisions they feel are best for themselves and for their healing. Her physical presence on campus is important, Zandi said. Her private office is located in the Klotz Student Health Center on the east side of campus, where she already has assisted dozens of survivors of sexual violence, domestic violence, dating violence and stalking. Zandi is part of the team at Strength United, a chartered center operated through CSUN’s Michael D. Eisner College of Education. Strength United was founded 28 years ago by Department of Educational Psychology and Counseling faculty, and it provides an interdisciplinary approach to ending abuse and violence. Ninety percent of its staff are CSUN alumni, and it trains 40 graduate-level and 120 undergraduate students a year to provide direct services to individuals of all ages who have experienced child maltreatment, and domestic and sexual violence. Strength United serves thousands of children and adults annually. It provides confidential 24/7 support and crisis intervention, along with long-term counseling, victim advocacy and prevention-education programs. With a survivor in her campus office, Zandi can pick up the phone and make calls together with the survivor — to a law enforcement detective, for example — if they don’t feel comfortable making those calls on their own. She can also accompany survivors as they make reports and provide statements, obtain restraining orders or undergo a forensic medical exam. As Care Advocate, Zandi can also work with various campus partners, such as the Title IX Office, to facilitate accommodations for survivors, including waivers for fees for pregnancy or sexually transmitted disease testing from the Student Health Center. She can also help make changes in a student’s academic schedule and other class accommodations, and put in place interim measures such as no-contact directives which are mutual agreements between parties not to have contact with one another, either directly or through social media, third parties, or other forms of communications. Throughout the upcoming school year, in addition to providing survivor advocacy, Zandi will continue to collaborate with key campus partners to address the campus culture through prevention education and awareness programming, she said. She offers trainings in partnership with Project D.A.T.E. (Discovering Alternatives for Today’s Encounters) and other peer educator programs, as well as with CSUN’s Title IX coordinator. “We have Project D.A.T.E, MenCARE, The BLUES Project and all these entities on campus that are focused on sexual assault prevention and outreach, [and] getting the community to talk about it,” Zandi said. Zandi said she also aims to meet with sororities, fraternities and athletic groups on campus to spread the word about the services she offers. Zandi’s door is open to any CSUN student, faculty or staff member, from 8 a.m. to 5 p.m. Monday through Friday. Her office is located in the Klotz Student Health Center, room 140G, and she can be reached at (818) 677-7492 or paria.zandi@csun.edu. After hours and on weekends, or to learn more about helping someone affected by child maltreatment, domestic violence or sexual violence, call Strength United at (818) 886-0453 or (661) 253-0258, or visit https://www.csun.edu/eisner-education/strength-united. CSUN also offers another confidential resource phone number, the CSUN Helpline, at (818) 347-HELP (4357) or online at http://www.csun.edu/helpline.